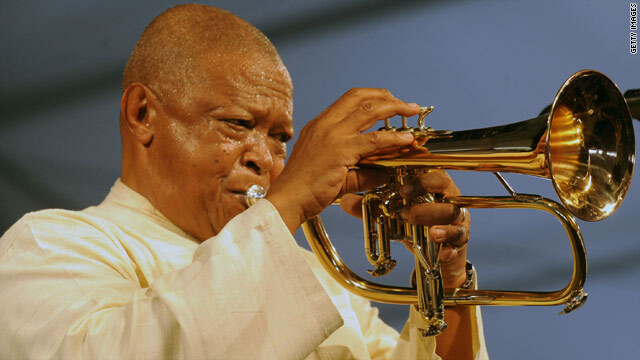 Veteran jazz trumpeter Hugh Masekela has been added to the bill at the World Cup launch concert on June 10. (CNN) -- International music stars Shakira, the Black-Eyed Peas and Alicia Keys will now be joined by several top South African names at the launch concert for the soccer World Cup in June. Local artists had been upset that the host nation would not well-represented at the June 10 event after only three acts -- BLK JKS, The Parlotones and folk singer Vusi Mahlasela -- were named in the initial line-up. But legendary jazz musician Hugh Masekela, the award-winning Freshlyground and Soweto Gospel Choir are among those added to the bill following a meeting with organizers last month. Soweto's Mzansi Youth Choir and Canada-based, Somalia-born hip-hop artist K'naan will also now appear at Johannesburg's Orlando Stadium the night before the month-long tournament kicks off. "As South Africans we are proud to be hosting the first ever World Cup on African soil," the 71-year-old Masekela told the South Africa Organizing Committee Web site. "I am very humbled and flattered to be part of this global event and am looking forward to the concert with great interest and excitement." Freshlyground, five-time South African Music Award winners, will perform the tournament's official anthem "Waka Waka (This Time For Africa)" with co-collaborator Shakira, the multi-million-selling Colombian singer. K'naan's Canadian hit "Wavin' Flag" has been remixed into a bilingual English-Spanish song which is Coca-Cola's official World Cup tune. Other featured artists include blind Mali duo Amadou & Mariam, 2008 Grammy Award winner Angelique Kidjo of Benin and six-time recipient John Legend of the United States. Shakira's platinum-selling compatriot Juanes is also on the bill along with Tuareg group Tinariwen and their fellow Malian Vieux Farka Toure. "We wanted to have an eclectic, international mix of music genres to appeal to as many people as possible around the world whilst at the same time showcasing the immense home-grown talent of the host country," said Niclas Ericson, director of TV for world soccer's governing body FIFA. The concert will be broadcast live worldwide, with profits going to FIFA's project to build 20 centers across Africa providing education, healthcare services and football training to disadvantaged communities. Orlando Stadium, in the suburb of Soweto, is also being used as a training facility for World Cup teams.